A men’s long sleeve t-shirt can take your look up a level. This simple yet stylish top can be turned from a basic to a statement piece with Contrado. Our Men’s Custom Long Sleeve T-Shirt is made to order and made in all sizes, from small to plus size long sleeve t-shirts. The fitted yet relaxed cut will flatter and keep you comfortable all day long. Design up to 6 parts, including your very own custom made clothing label. When you want to look stylish and smart, yet still be comfortable, then a great long sleeve t-shirt is the perfect alternative to a short sleeve t-shirt or shirt. Even better, with Contrado, you can design your own men’s long sleeve t-shirt to look however you want, in any size you want. 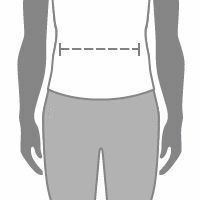 Our t-shirt template allows you to upload your designs on up to 6 parts of this cut and sew t-shirt. From the sleeves, to the front and back, to the rib and even the label, this fashion must-have will make your look stand out from the crowd in a style entirely your own! Also available in a short-sleeved cut. This is a single jersey stretch fabric and is always a popular choice for customized t-shirt printing. It is strong and breathable and has a lovely cotton feel against the skin. This printed jersey prints beautifully. It has a solid, slightly opaque face, with very good printing quality showing fine lines and intricate detailing brilliantly. If you want your custom long sleeve t-shirt to have added personality, then we recommend this jersey! It is very stretchy and the fabric will bounce back into shape after it has been manipulated. This cotton jersey has a medium weight with breathable, moisture wicking properties. Repeat print patterns look best. Our Natural Bounce Jersey gives colors a slightly muted, desaturated finish, giving it a vintage washed look. We advise against large areas of solid color. This jersey fabric is a weightier option, for those wanting a slightly heavier t-shirt. It also has an opaquer base than the other jersey options and a more elasticated give, with almost a double stretch attribute. A lovely, soft fabric, which gets the most solid color when printing. Want to create T-Shirts with that impressive professional finish? Promote your brand with our sewn-in fabric labels. Made from the same soft Jersey as your tee, these bold labels will make a big impact on customers. Show off your brand and impress customers. 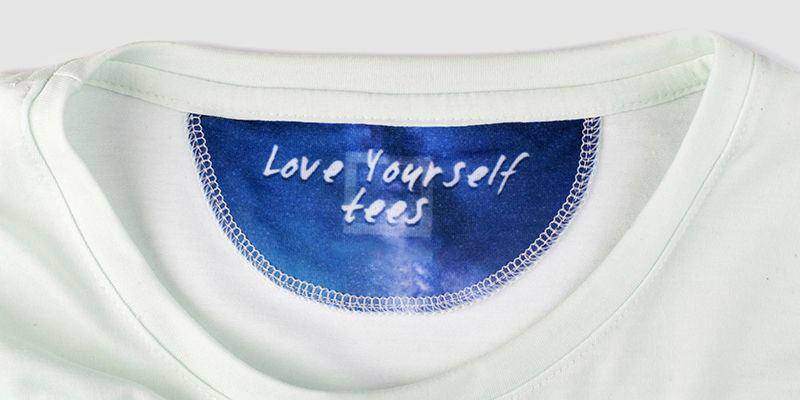 Each label is as personal as the tee it’s printed with, and you can even add a name, or custom message. 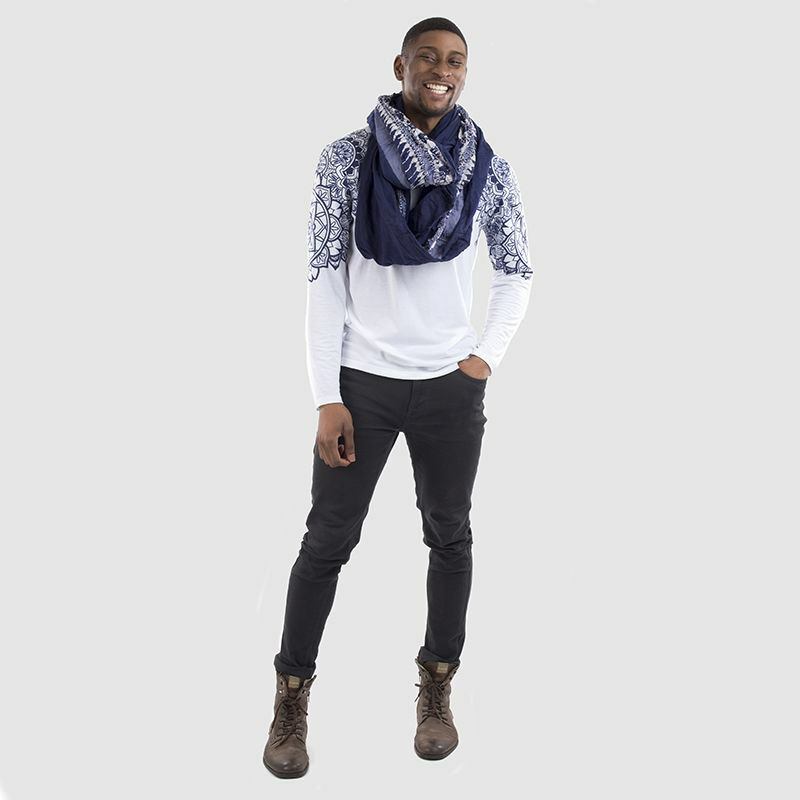 A long sleeve t-shirt can be worn in so many ways to embrace your unique style. Our men's long sleeve t-shirt has a true to size fit, so if you want a more form-fitting look, go a size smaller and for a more relaxed and laidback look, opt for the next size up. Why not pay homage to the 90's trend and layer our Men’s Cut and Sew T-Shirt on top and team with a lumberjack shirt, your favorite jeans and a pair of workman boots? Your new garment is made from a high quality, long lasting fabric. Follow our care instructions to ensure it lasts for many years! Turn inside out before washing. Iron on the reverse of the printed side. 86°F wash. Low tumble heat. Do not wring. Low heat iron. Steam safe. Super comfortable and design looks amazing. Really happy. How does this men’s long sleeve t-shirt fit? We have designed this exclusive long sleeve t-shirt to be true to size. This means that we cut them to have a fitted yet slightly relaxed shape. The sizes range from XS to a 7XL The fit is your choice. If you prefer a skinny and form-fitting shape, then we suggest creating one a size smaller, or, if you like a baggier and relaxed look, then go for one a size larger. Is the fabric appropriate for winter wear? There are 3 options of fabric when it comes to making your cut and sew long sleeve t-shirt. There are 2 poly jerseys and 1 cotton jersey, ranging from 4.72 oz, 5.31 oz and 5.60 oz. The lightest of these fabrics is probably best for summer t-shirts, as it is somewhat transparent. The 5.31 oz is a great all-rounder, not too light or heavy but for a winter top, the heavier 5.60 oz would be best. Is it possible for me to brand these t-shirts? Absolutely yes! We will soon be launching a designer marketplace online, where you can upload and sell your designs on our custom made products. If you want more info on this, please click here. You can also brand these designer men’s long sleeve t-shirts now by uploading your design and creating your own bespoke clothing label, which we stitch into the back of the neck. This Men's Long sleeve T-Shirt is the same regular fit as our Cut & Sew T-Shirt. Our model Wofai is 6'1" with a 38in chest, 29in waist, and wears a size Medium.